Coming back today most of the eyes, and probably a lot of money in the Rio Sportsbook, were on first-time bracelet hunting David Baker and Shawn Buchanan. Layne Flack and Josh Arieh have enjoyed their spills; surely one of these two renowned players would close the deal. It wasn’t to be as Benjamin Lazer and Randy Ohel were the ones to make it to head-up. 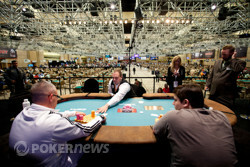 Then began one of the most epic duels in World Series of Poker History. Their battle lasted for six and a half hours including a dinner break. The chip lead changed sides so many times we lost count. Both players had 90% of the chips in play at least twice each, but both somehow managed to fight their way back from fumes on each occasion. Something, or someone, had to give and it turned out to be Lazer. He got down to less than one big blind at nearly 2:00 AM and that situation, even for him, was too much to come back from. Ohel had a rail full of fans with him for hours upon hours and they, as he, were just as full as relief, as well as joy, come the end of the match. Back to the beginning of the day and nine players returned. One was a lot shorter than the rest, and it came as no surprise to see Arieh first out. He got to showdown all-in versus Buchanan who fanned an eighty-six, and Arieh mucked his hand before heading to the rail. He was followed soon after by Flack who was called all-in on the last betting round versus Von Altizer, who opened . Flack mucked and looked very disappointed in defeat. The remaining seven players all joined together on the secondary feature table in the Pavilion room and it didn’t take long for official final table of six to be set. Altizer had played this whole tournament with a big smile on her face and she continued to smile even when she fell to Lazer’s smooth eighty-five. There was a lot of chip movement after this as most of the remaining players were keen to be in the action. None more so that Buchanan but his up-and-down day ended when he paired on the last draw when all-in to lose his chips to Lazer. It was Ohel who pushing a lot of the action at this pot and that helped him into a clear chip lead. That being said it was Lazer who took another scalp, that of the quiet Jason Lavallee. 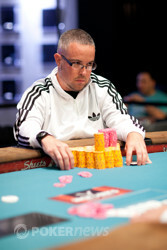 Lazer fanned a seventy-six, besting Lavallee who called all-in for just a few chips with . Baker and Farzad Bonyadi were, by far, the two short stacks at this stage but they continued to play a brave and aggressive game with their eyes seemingly on the gold rather than the money jumps. The cards didn’t fall for them though, and it was Bonyadi who went in fourth when his eighty-six was beaten by Baker’s . That was the last thing that went right for Baker and the final nail in his coffin came when his caught a pair on the final draw to lose out to Ohel’s . Benjamin Lazer - 2nd Place. 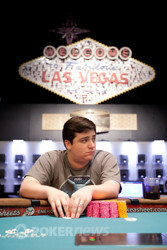 Benjamin Lazer was very short entering the last hand, and got the rest of his stack in the middle. Randy Ohel quickly called. On the first draw, Lazer drew two cards, and Ohel two. On the second draw, Lazer stood pat, and Ohel drew one. There was a little bit of confusion on the third draw, and both players knuckled the felt, indicating a pat, but Lazer actually drew one card. Ohel fanned , and Lazer showed . 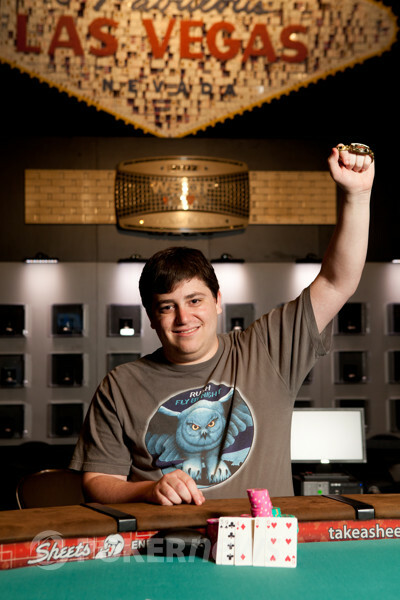 He paired his five in the end, and Ohel is your winner! Benjamin Lazer is down to less than one big bet now. Randy Ohel limp-called a raise and then stood pat all the way down as Lazer drew three, two, and one. He stayed with Ohel's betting until the end but it was clear that Ohel was very strong. Lazer admitted defeat on the third betting round, and folded. Surely he can't come back from here! Benjamin Lazer had the button, and raised. Randy Ohel called. Both players drew two cards, and Ohel led out. Lazer moved all in, and Ohel called. Ohel drew one, Lazer drew two, and Ohel stood pat. Lazer tanked for a bit, then drew two more. "I have a ten," Ohel said, fanning . Lazer received his two new cards, looked at them, then tabled , doubling him to 400,000 chips. 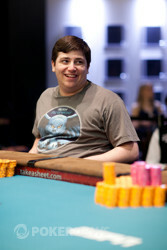 Benjamin Lazer lost half his stack on the first hand back. Randy Ohel limp-called a raise and went on to draw three, two, and one. Lazer drew two, one, and one. He led the betting until the third betting round where Ohel led out. Sound familiar? "You got it," said Lazer and folded. Randy Ohel had the button, and raised. Benjamin Lazer three-bet, Ohel four-bet, and Lazer called. Both players drew one card, then checked. Both players drew one card again, and Lazer check-called a bet. On the final draw, Lazer took one card, and Ohel stood pat. Lazer check-folded, leaving himself with just 225,000 chips. The clock read 00:43, and the tournament director asked how long the players wanted to break for. "As long as possible," Lazer joked. He then sweated his cards and raised. "We might not need it though." Ohel three-bet, Lazer four-bet, and Ohel called. Ohel drew one card, and Lazer two. Ohel led out, and Lazer raised all in for an extra 25,000-chip. Ohel called. Both players drew one card, and then Ohel drew one more. Lazer stood pat. "What do I have to beat?" Ohel asked. "I'm drawing dead," Ohel said, mucking face up. Benjamin Lazer is back in deep trouble after a hand where it looked as if he was leading until the last draw. He opened and Randy Ohel called from the big blind. Ohel drew two, one, and one. Lazer drew one, one, and stood pat. Lazer led the betting until the final betting round when Ohel led out. Call. Ohel tabled . A frustrated Lazer threw down his cards and were exposed. Randy Ohel opened with the button, and Benjamin Lazer called. Lazer drew three, Ohel drew two, and Lazer checked. Ohel bet, Lazer check-raised, Ohel re-raised, and Lazer put in the fourth bet. Ohel called. Both players patted on the last two draws, and Lazer checked to Ohel who bet. Lazer unhappily mucked, and Oher shipped the pot.